This map was not part of the journal article, but has been added by the editor to aid the reader in understanding the relationship between the locales mentioned below. The Prince of Wales Strait is the narrow body of water between Banks and Victoria Islands. This study characterizes population genetic structure among grey wolves (Canis lupus) in northwestern Canada, and discusses potential physical and biological determinants of this structure. Four hundred and ninety-one grey wolves, from nine regions in the Yukon, Northwest Territories (NT) and British Columbia, were genotyped using nine microsatellite loci. Results indicate that wolf gene flow is reduced significantly across the Mackenzie River, most likely due to the north-south migration patterns of the barren-ground caribou herds that flank it. Furthermore, although Banks and Victoria Island wolves are genetically similar, they are distinct from mainland wolf populations across the Amundsen Gulf. However, low-level island-mainland wolf migration may occur in conjunction with the movements of the Dolphin-Union caribou herd. Whereas previous authors have examined isolation-by-distance in wolves, this study is the first to demonstrate correlations between genetic structure of wolf populations and the presence of topographical barriers between them. Perhaps most interesting is the possibility that these barriers reflect prey specialization by wolves in different regions. The grey wolf (Canis lupus) has one of the greatest natural ranges of any living species. Wolves are successful in a broad array of habitats with differing climates, topographies and prey spectrums. The wolves of northwestern Canada (British Columbia, Yukon and Northwest Territories) typify this adaptability. Here, "wolf country" means everything from highland forest to barren-ground tundra. It includes the Rocky Mountains, the Mackenzie Delta and the islands of the Arctic Archipelago. Topography is not the only inconstant in this region. Variation in the type and density of available prey is significant. Indeed, this variation has necessitated the development of two distinct behavioural patterns in resident wolves. Throughout British Columbia and most of the Yukon, where moose are the dominant prey species, wolves are strictly territorial. In contrast, wolves in barren-ground caribou ranges are migratory; they associate with and follow the seasonal movements of the herds. Wolves, whether territorial or migratory, are highly mobile. Barren-ground wolf packs traverse thousands of kilometres every year, whereas individual wolves have been known to travel in excess of 800 km. Furthermore, dispersal frequency is estimated to be near 25%. In a species with such high vagility, extensive gene flow might be expected to reduce genetic differentiation between even distant populations. Although geographical distance may still be of influence, we might expect other factors to have a greater impact on the genetic structure of wolf populations. One of these possibilities, topographic barriers to gene flow, has been investigated for smaller canids, but such studies have not previously been conducted in wolves. Northwestern Canadian wolf habitat contains several candidate barriers to gene flow; we examined the Mackenzie River, and channels of the Arctic Ocean, as potential determinants of wolf population genetic structure. Our primary objective was to ascertain whether these topographic features act as barriers to wolf gene flow, and how their effect compares with that of linear distance. Second, we sought to establish whether patterns of gene flow observed among barren-ground wolves can be explained by the migration patterns of barren-ground caribou. Because high levels of gene flow are expected for wolves, we needed a molecular marker capable of detecting even small genetic differences between regions. The hypervariability of microsatellite loci provided the required sensitivity. ....Samples were contributed by biologists in Kluane National Park (Yukon Territory), Ft. St. John (British Columbia), and the Northwest and Yukon Territories. Tissue samples were taken from hunted wolves throughout the NT/YT; Kluane National Park and Ft. St. John samples consisted of blood drawn from live-captured wolves. ....DNA extraction was performed with DNeasy Tissue kits (QIAGEN) according to the manufacturer's instructions. Tuk/Inuvik and Victoria Island had the highest and lowest allelic diversities (and sample sizes) respectively. Average allelic diversity of mainland populations was 6.21, of island populations 4.66....Expected heterozygosity ranged from 59.86% (Banks Island) to 74.42% (Great Bear Lake). Average expected heterozygosity of mainland wolves was equal to 8% higher than the average for the islands. 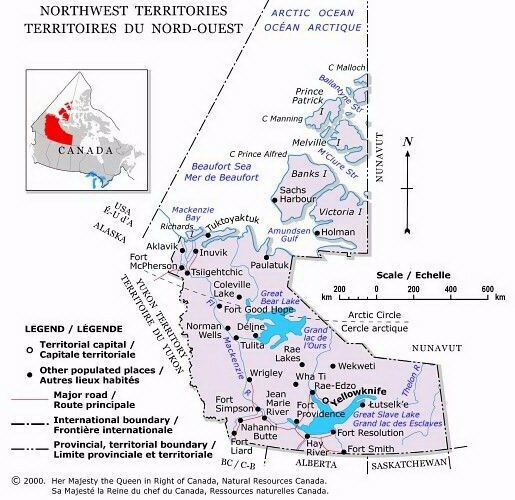 Furthermore, expected heterozygosity of the Banks Island population is significantly lower than that of Ft. St. John, Tuk/Inuvik, and Great Bear Lake, the Northern Richardsons, Kluane National Park and Paulatuk. Expected heterozygosity of wolves on Victoria Island was not significantly lower than that of mainland wolves. Local residents report two wolf phenotypes on Banks Island. Southern wolves range from white to pale grey, all with a reddish cast, whereas northern wolves lack this reddish tinge....Because our Banks Island samples could be divided according to "northern" or "southern" harvest locations...we were able to screen for substructure within the population. Because previous analysis suggested that island wolves are genetically far more similar to each other than to mainland wolves, we included the Victoria Island samples for comparison. ....[C]ross-assignment was most common between North and South Banks, and least common between North Banks and Victoria Island. Furthermore, cross-assignment between South Banks Island and Victoria Island was significantly greater than expected due to chance....The increased genetic similarity between Victoria Island and South Banks Island (compared with Victoria and North Banks Island) may support migration of wolves to South Banks Island from Victoria Island. However, observed differences in standard genetic difference...are small and should be interpreted with caution. ....Like geographical distance, the presence of the Mackenzie River is strongly correlated with increased genetic distance between regions. Gene flow among regions flanking the river is more common in the north-south, than in the east-west direction. However, because the River is frozen for 6-8 months of the year, it should not of itself pose a significant barrier to wolf movement. North-south migration of resident caribou herds may be a greater determinant of the structure we observe because wolf movements are more likely to be driven by the movements of their prey. However, wolves that do attempt at east-west migration would face two additional challenges. A limited temporal restriction still exists as the river can only be crossed while it is frozen. Furthermore, the Mackenzie Delta has one of the highest levels of human activities in the NT, and avoidance of humans, or human-induced mortality of migrant wolves, might also reduce gene flow across the river. ....[T]est results suggest relatively low levels of genetic differentiation among mainland wolves on the same side of the Mackenzie River (Ft. St. John and Kluane National Park excluded). The migratory behaviour of wolves on the barren-grounds could contribute to this result in two ways. First, related wolves may be harvested in different regions at different times, as their packs follow migrating caribou herds. Second, these seasonal migrations may increase the probability of gene flow (for example, if a wolf from Tuk/Inuvik followed the caribou to Great Bear Lake, then mated with a wolf from this region). It is worth mentioning that, despite relatively high levels of gene flow in these areas, there remain significant genetic differences among wolves in different regions. Whether by topographic barrier or prey specialization, our data suggests that Banks Island wolves are genetically isolated from the mainland....Banks Island, and to a lesser extent Victoria Island, may...be insular populations, subject to increased genetic drift. For Banks Island wolves, the effects of drift in isolation are likely accentuated by two confounding factors. Wolves were extirpated from Banks Island in the 1950s; natural recolonization began in the 1970s. The origin of the founders is unknown, but of the populations surveyed here, Victoria Island seems most likely. Second, 30-50 Banks Island wolves, 15-25% of the total estimated population, are harvested annually. Harvesting bottlenecks, combined with the tendency to harvest multiple animals per pack, may also accelerate genetic drift on Banks Island. ....Island-mainland wolf migration. Banks and Victoria Island wolves are genetically isolated from mainland wolves. However, genetic evidence, combined with recent sightings of white wolves, considered to be island wolves, in the Tuk/Inuvik region, suggests that limited island-mainland migration does occur. The Dolphin-Union caribou herd migrates annually from Victoria Island to the mainland and back; it is therefore likely that the putative island wolves in our Tuk/Inuvik sample are indeed island wolves that followed this herd to the mainland. Thus, the Dolphin-Union caribou may serve as a corridor for wolf gene flow across the barrier of the Amundsen Gulf. The movements of the herd may also explain why Victoria Island wolves appear genetically closer to mainland animals than do the wolves of Banks Island. The Dolphin-Union migration occurs annually; Banks Island Peary caribou have not been observed on the mainland since 1952. Therefore, migration of wolves from banks Island to the mainland (and vice versa) would be more likely to occur via Victoria Island than directly across the Amundsen Gulf. ....Inter-island gene flow is much greater than island-mainland gene flow. Indeed, the Prince of Wales Strait...is not a barrier to gene flow. This conclusion is supported by the observation of wolf tracks on the pack ice between Banks and Victoria Island[s]. The presence of the Mackenzie River is associated with a significant increase in genetic distance between wolves in different regions. Although the slight temporal restriction posed by the River itself, and high levels of human activity in the Mackenzie Delta likely contribute to this effect, migration patterns of barren-ground caribou may be the primary determinant of wolf population structure in this area. If further study supports this conclusion, caribou herd boundaries may suggest appropriate management units for barren-ground wolf populations. The Amundsen Gulf presents a barrier to island-mainland gene flow that may also result from predator-prey interactions. Isolation of the Banks Island population is most pronounced, and may result from a combination of factors: drift in isolation, recent recolonization and annual anthropogenic bottlenecks. Forbes and Hogg (1999) suggest that the combination of elevated genetic distance and reduced genetic diversity, observed here, may signify "a population of particular management concern." However, gene flow between Banks and Victoria Island is high, and the Dolphin-Union caribou herd may facilitate some island-mainland migration. Furthermore, although expected heterozygosity on Banks Island is low compared to mainland populations surveyed here, diversity is not currently declining, and remains within or above the ranges reported for other, noninsular wolf and carnivore populations. This study is the first to discover correlations between topographical features and population structure in wolves. Perhaps more exciting, much of the structure we observe could be the result of prey specialization by wolves in different regions....[I]t will be interesting to determine whether similar relationships exist among other populations separated by physical barriers or prey specialization. Figure 1: Topographic features and home ranges of barren-ground caribou herds within the study area; boundaries of wolf sampling locations for NT/YT regions. Figure 2: Neighbour-joining tree based on standard genetic difference values between each pair of regions. Figure 3: Assignment test results between Banks Island and Tuk/Inuvik. Figure 4: Plot of standard genetic difference against geographical distance between regions. Table 1: Genetic diversity in each geographical region. Table 2: Standard genetic difference between regions. Table 3: Summary of cross-assignment between regions. Table 4: Results of the Mantel test.